Students may undertake an enrollments as a part of a group on a study tour or a group can be invoiced as a group for their specified activities. The purpose of this section of the manual is to provide you with details regarding how to set up and manage Study Tour Groups in eBECAS. in eBECAS you are able to create groups for students that are studying at your College the same course or education program. An example of a group may be a study tour from a Japanese secondary school. You are able to provide multiple offers and create multiple group enrolments for all students in the group. Students in a group are added into eBECAS and are provided with one group invoice. From the main menu, you can search by Group name, please always search first and if the group does not exist, you can add a new Study Tour Group. You can either add the Study Group details by pressing the New button or display the selected Study Group by pressing Modify. Each group can have multiple offers and group enrollment details. This means that over several years, the same group may have sent many groups of students. Each group booking is processed first as an offer then accepted as an enrollment. A group offer is a planning and quoting tool. Once an offer is accepted, the relevant debtors are entered in financials and the group enrollment is generated. The Group Offer search is a follow up tool that is intended for use by the marketing department. This allows staff to follow up group offers that have not yet been accepted. Offers can be searched by offer date, any start date of courses listed in the offer, any requested accommodation start date of homestay placements listed in the offer and any airport transfer date of transfers listed in the offer. Processing Study Group bookings – Typically the exchange between a Group and a College will involve one or many offers before a final offer is accepted and a Group Enrolment is created. We suggest that if an offer is significantly changed, the old offer is cancelled and a new offer is entered. By keeping this history, you to have a record of the negotiations. A group offer lists courses, insurance, accommodation placement, accommodation, airport transfer and other fees. The maximum number of students for the group can be specified. There are a number of tools that are created specifically for the group course offer item. One of these is the student multiplier, which multiplies the weekly course cost by the number of weeks and number of students so that you can generate a quote that represents the total for a group. You can add the names and other details for the students in a study group. The students can be added as new students, which will add a new student record to the system. Ideally you should first check the New (Existing) students to ensure that the student is not duplicated. 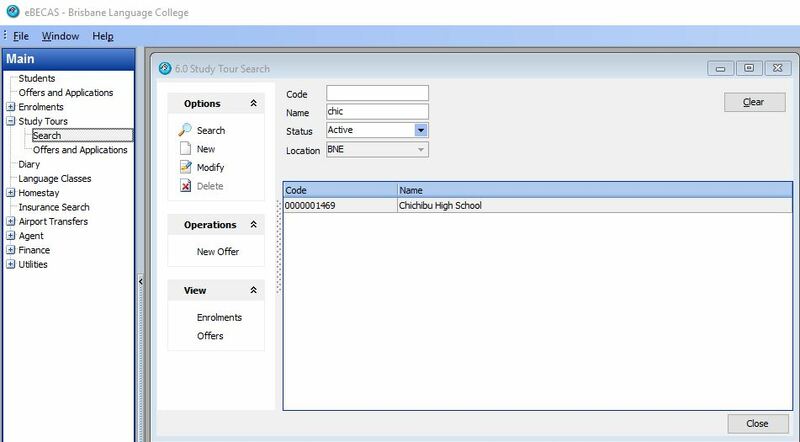 The standard Student details screen is displayed for you to add the student’s details. 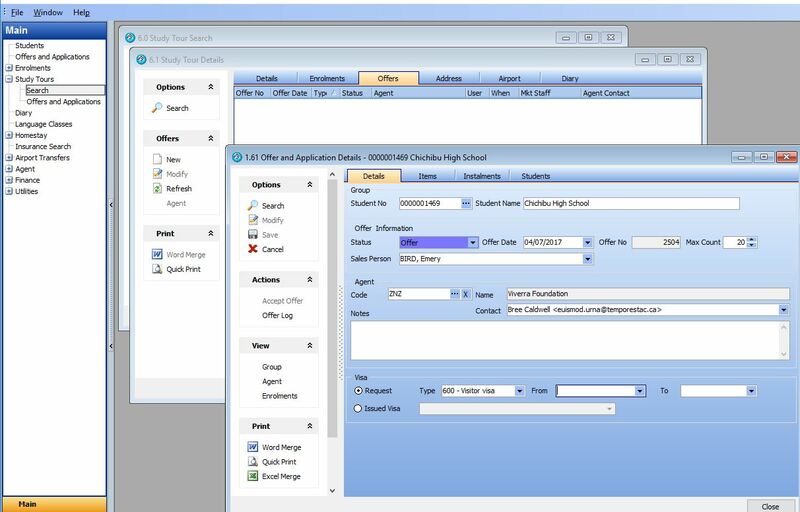 You will use the same standard student details screen to add details for an existing student. You can add multiple students to the Group offer. When an offer needs to be accepted to create an enrollment, press the Action – Accept Offer button on the left hand panel. This will generate the group enrollment and enrollment details for the group for all students. After the Group offer has been accepted, you are able to display the Group Enrollments. You will be able to see all current, future and past enrollments for that group. 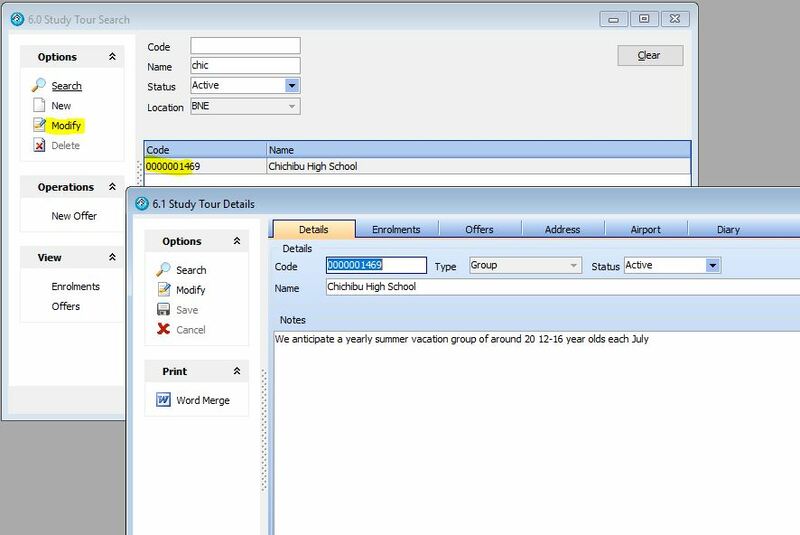 Group Enrollments details can be displayed by pressing Modify or double clicking the enrollment. The group enrollments details include a history of all changes made to the enrollment such as start date, end date or course length. To view this please select the History tab in the group enrollment details. To view a list of all fees relevant to a group enrollment please select the fees tab. There are a number of different types of fees that can appear here, such as invoices, payments, credits and debits. In this tab fees can also be scheduled for part payment if needed. The fees can be viewed by Invoice, Transaction and by Scheduled payments, which will show payments to Homestay accommodation providers, airport transfer providers and insurance providers. By navigating to the Students tab in the group enrollment details you can view details about the individual students in that group. You can display the student details by pressing the View – Student button or opening the Student Enrollment window. The student enrollment window will display the group that student may belong too. The student may also have other non-group enrollments. It is often important to check whether or not a student is a part of any group enrollments.